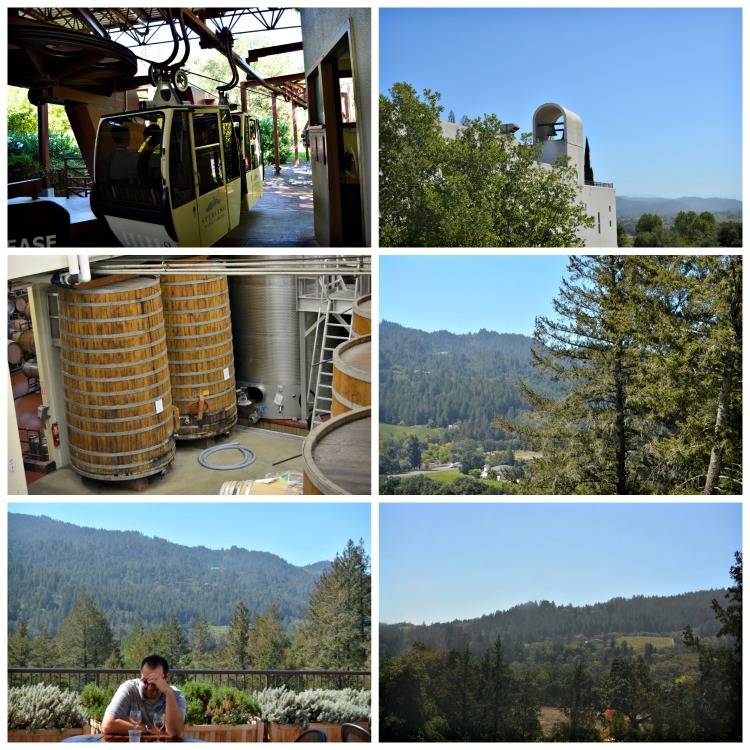 On our fourth day of vacation, Andrew planned for us to travel north to Calistoga. While planning, he did a great job of keeping us in the same general area so we didn't have to spend much time in the car. We read horror stories of bumper to bumper traffic, but we never really saw much, likely because we spent most of our time in Napa during the week. We went to Redd Wood for breakfast, which was down the street from our hotel. It was highly acclaimed, but the breakfast was nothing special. I had lemon ricotta pancakes and Andrew had an omelet - both were good, but neither were amazing. It was nice to sit outside, though, as the weather was pretty and there were a lot of locals and vacationers walking by. Our first winery of the day was one of the prettiest we visited - Chateau Montelena. Its claim to fame is putting Napa Valley wines on the map during the Judgement of Paris in 1976. The Chateau itself was built into the mountain and was surrounded by Japanese-looking gardens and waterways. We were able to see huge crates full of grapes in front of the chateau, too. In the tasting room, the amount of attention was great. We were able to share a tasting and learn a good amount of the winery's history. We opted out of the full tour, but we were able to walk ourselves around the grounds and take pictures at our own pace. It was one of my favorites just to see. Chinese gardens, the Chateau, grapes ready to be processed (the tanks were huge), and views. After that, we went to Frank Family Vineyards. 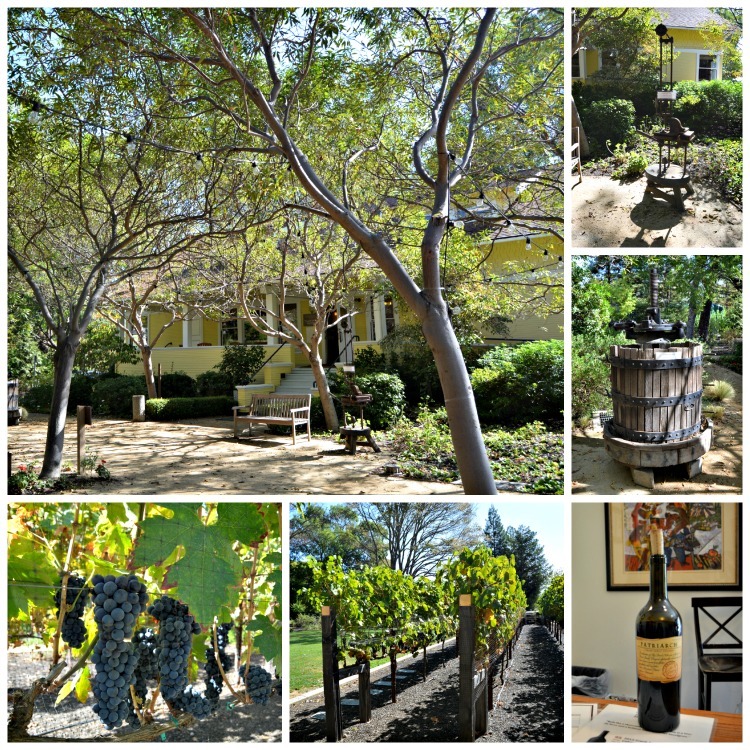 The property was pretty, but the tasting room was kind of plain and felt very commercialized. 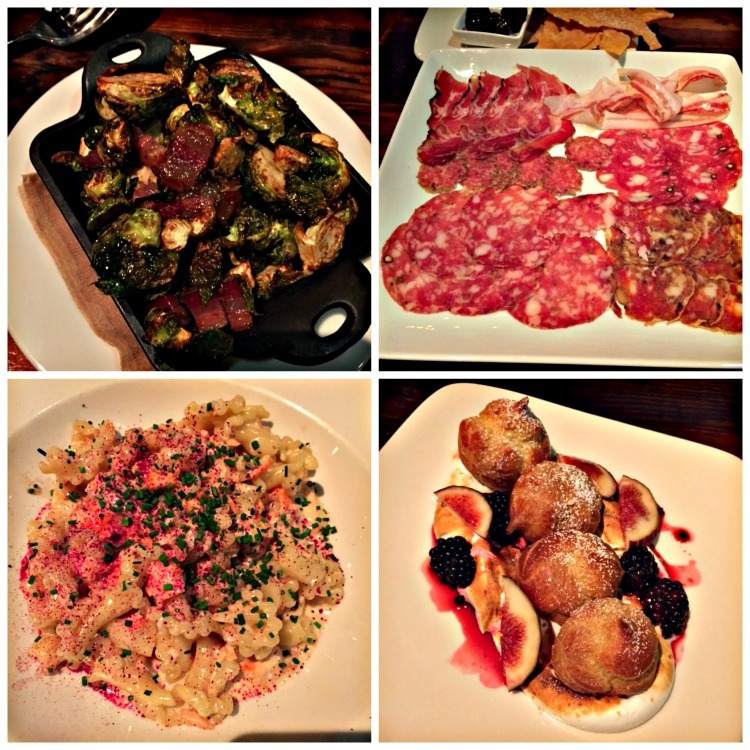 There were different levels of tastings, and we opted to share one. We were shown to a room with the person leading the tasting and an older couple who was already about halfway through their tasting. We could tell that the employee had already established that the older couple was very well-off, and while he was nice to us, we were a little more of an afterthought. However, he let them taste a new Frank Family wine not normally included in the tasting called The Patriarch which just came out (and was $225 a bottle) and out of obligation, he let us try it, too. I didn't appreciate the other aspects of service, though, as I felt like he was saying he knew we didn't have the same means as the other couple (we don't. They were splitting the shipment between their various homes, but I didn't need him to remind me!). It was just awkward. We still ended up purchasing a few bottles of wine, though (but not The Patriarch!). A subtle, homey tasting room with old winemaking equipment and vineyards outside. I needed a picture of the Patriarch since we didn't get any of our own. My aunt and uncle went to Napa last year and kept telling me about the gondola ride at Sterling Vineyards, so I had to go. Sterling wines are available in grocery stores, so we visited here just for the gondola and the scenery. Unfortunately, all of that is included with the cost of the tasting and keeping a glass, so we couldn't share the fee and had to pay for wine we didn't really want. I loved the views of the gondola up the mountain. The views from the mountaintop facility were lovely, too. The set-up was nice in that there were four samples you could get at your own pace as you went through the facility. It was interesting to see the giant barrels used for mass produced wines compared to the smaller barrels we saw at other wineries the day before. The views and the experience were great if you need a short break from drinking, but don't plan to fall in love with Sterling wines. The gondola | The bell on the tower on top of the mountain | These barrels were at least thirty feet tall - you could see the difference between large and small wineries here | more views, including Andrew not enjoying his wine despite the fantastic patio. We had time before our next winery appointment, so we looked for somewhere to have lunch and of course Andrew found a barbecue place. Nothing else sounded good, and I wasn't very hungry after our large breakfast anyway, so I was willing to give in. After all, I owed him from the gondola ride. California barbecue was, in a word, disgusting. At least this was. It was covered in sauce and chewy. The potato salad was undercooked. At least, Buster's BBQ in Calistoga was. Avoid it! We also had time to walk around downtown Calistoga, which was really cute, though I didn't have time to really stop and look at much. To get a break from all of the reds, Andrew made an appointment at Schramsberg Winery, known for its sparkling wines (my favorite). This was a small group cave tour by appointment only. This cave was mostly hand dug and is the largest in Napa Valley. The inside was dark and covered with moss and only a limited amount of electricity was run inside. It was our tour guide's first time giving a tour, which I think affected our visit, but he talked about the winery's origins and how making sparkling wine differs from making stills. 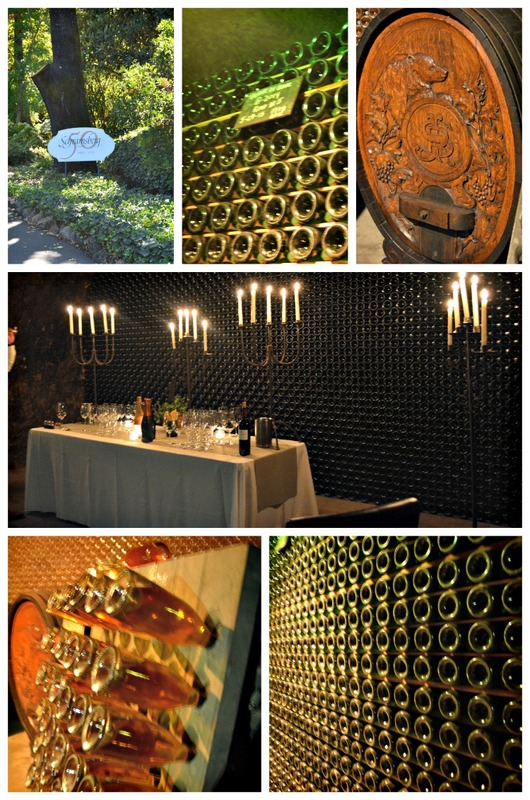 Inside the cave, a large table with two candelabras was set up for our tasting. It was a far different experience from anything else we did, and the sheer number of bottles inside the cave was neat to see. Availability at Schramsberg is limited and reservations are apparently increasingly difficult to get, so they require that each person pay a tasting fee and don't discount it for purchasing wine. I liked the tasting area of the cave tour. If you look to the side of the wall of wine, you can see all of the natural moss inside the cave. 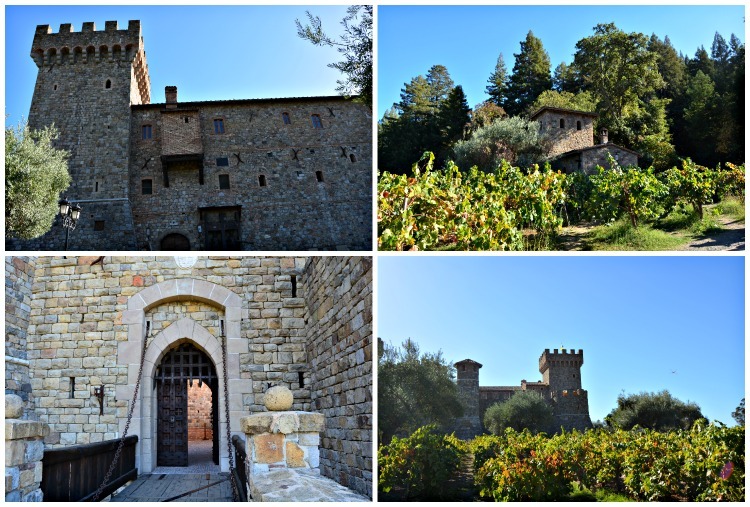 We had heard great things about Castello di Amarosa, a castle-like winery that was supposed to be beautiful. It is not known for having great wine. We were hoping to stop in and purchase a glass each and walk around, but the only option was to pay $25 per person for a tasting to get inside the castle, and we opted out of it. After going to Sterling just for a look around, we didn't want to do that again. I did take photos of the outside, though, as it was really pretty. We got back into Yountville around 5pm and went to V Marketplace, next to our hotel. It has shops that sell everything from toys to chocolates to souvenirs, but of course it closed at 5:30, so I didn't get to look at too much. We also went to the Hill Family Tasting Room that was in walking distance and had a great experience. We were able to share a tasting and got to hear stories about the Hill family. They had all kinds of sports memorabilia in the tasting room as well as a surfboard and guitar stained with red wine and fun little vases and gifts to buy. There was a huge replica of a chair from The Voice that I had to sit in, too. It was a great place to check out. Andrew wanted to drive back in to Napa for dinner at a place called Oenotri. Reservations are definitely needed at this place as the wait was over an hour. We decided to walk down the street back to Oxbow Public Market so Andrew could have some pre-dinner oysters (he loved them that much) and we could do some window shopping. Dinner at Oenotri was good and I loved our table in the window so we could people watch. They are known for their charcuterie, which was good, and I had a smoked salmon pasta dish, which I had never seen before. It was a good meal, but not great. I'm glad we found something to do during the long wait! After dinner, we went back to Yountville and our hotel for a good night's sleep before our last day of vacation. The lighting was awful for pictures. Food was good at the time but mostly forgettable now. Wow, you really did pack a lot in! I'm impressed. We recently visited one (!) champagne cellar in Reims and I was done for the day. Sorry to hear about variable service and slightly disappointing food... Hopefully the wine made up for it! Looks like the scenery is pretty special too. I love the cave room set up with the candelabras. I also like the castle. I'm a sucker for settings. What fun!!!! I think I'm all in for the gondola ride and the castle. I have a castle fascination and have yet to go in one. I'd like to visit one in Europe, but I don't know when that would happen so I'll settle for Napa. The Gondola is gimicky, but I'm such a sucker for that kind of thing. 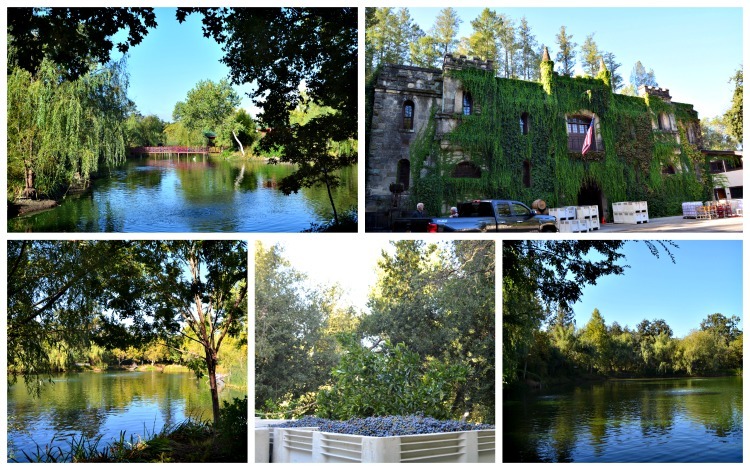 That first winery with the hanging trees near the water and the building itself are just beautiful!!!!! I get imagine spending over $200 on one bottle of wine. Yikes!!! I guess it was cool that you at least got to taste it. Even if the whole experience was a little awkward. The cave tour looked really cool. All those bottles!!!! I can't imagine any BBQ outside of the south tasting good. Well, there was this one place when I lived in PA that was amazing but they closed down a long time ago. But for the most part, people outside the south (TX is the south, duh!!!) do not know how to BBQ. Not even a little. Schramsberg!!! I want to plop a cozy sofa down and live in the cave. Love. Great recap. I love all the winery pictures!! P and I must go back and try to some of the wineries. We did one on our trip, just because we didn't really have time to plan and didn't have a lot of time in Napa. I want to go on a gondola and to Schramsberg! !